Well, fall finally happened. I think. Oklahoma is notorious for "if you don't like the weather stick around for another day and it will change." It could be 90 next week. We'll see. I have to say, I am usually not a fan of cold weather, but I am so thankful for it this year. 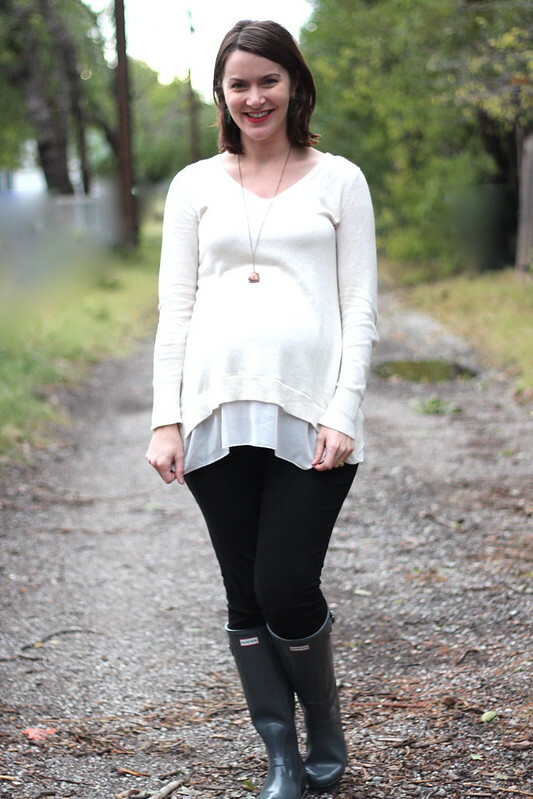 Layers and sweaters are going to keep me going through the end of this pregnancy without buying anything else (I hope!). Also, donuts. Donuts are keeping me going throughout the end of this pregnancy. I am usually not a sweets person, but dear Lord, donuts are my weakness. I'm eating a blueberry cake crumb donut as I type this. I just thought I would share that with you. Also, I've gained about 40lbs at this point. Not that surprising when you consider the fact I just typed a whole paragraph about donuts. 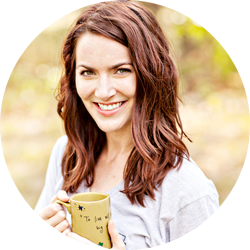 I went through so many food craving phases, including donuts! 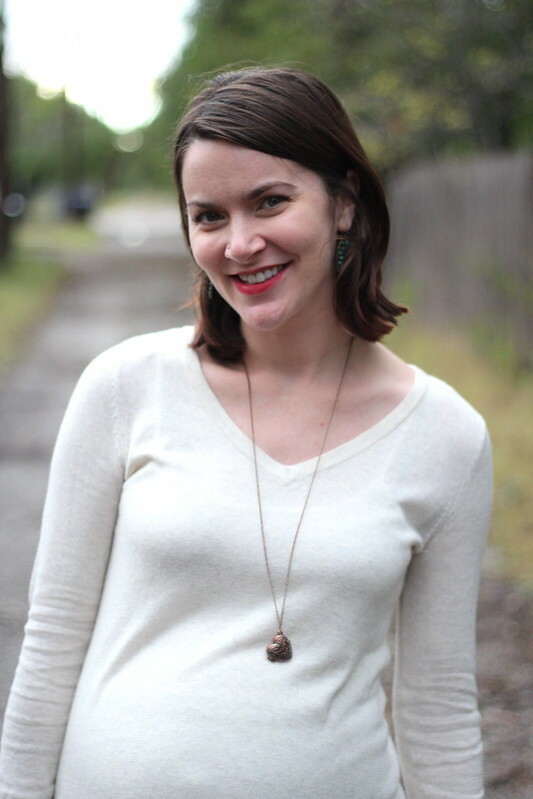 Your sweater is so pretty with the sheer layer! Such a cozy look! Donuts. Yum! I love this look. Glad it's cooling down for you! mmm donuts. Now I want one. Annndddd now I want donuts. That's not even fair. I'm just over here daydreaming about donuts now. well hello baby bump so cute ! have a great week lady ! Loveeeee this sweater! And donuts. YES. Don't fee bad, I could write a paragraph about donuts and I'm not pregnant. I just live for food and think about it 24-7. You could dedicate a whole post about donuts and that would be okay by me. I think I've gained 40lbs and I'm not even pregnant, sigh. Super cute outfit by the by! This sweater is so cute! 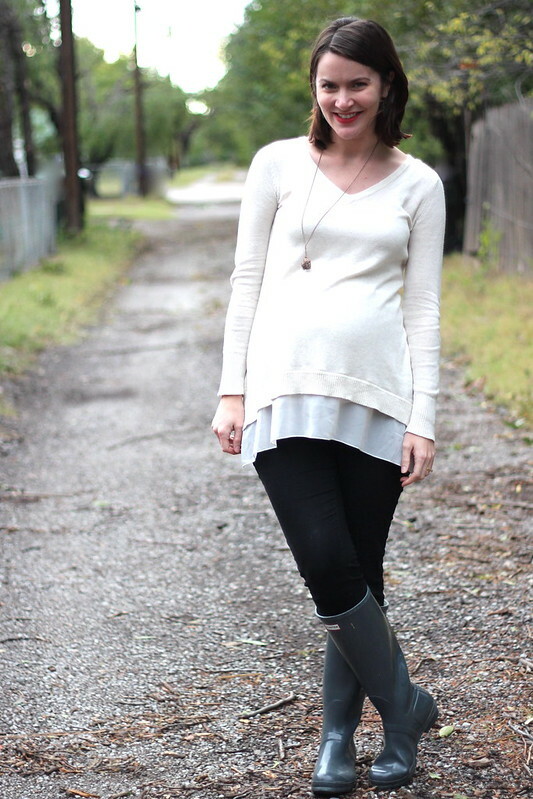 I love the layered look of it and it is adorable with your rain boots! I don't even go down to the teacher's lounge for fear of seeing doughnuts. Because then I would have to eat 1 (well actually 3). Love your sweater and the long necklace with it!! The donuts commentary made me laugh, too cute:) I'm a sweets person but with my first pregnancy I couldn't stand to eat anything sweet. Then with the second all bets were off and I gained 50 lbs, lol. You go ahead and gain as much weight as you damn well please. You are, after all, growing a human in there. ;) Yay for layers and layers of sweaters! If this rain doesn't let up soon, I will have to pick up a pair of rain boots for myself! I really like this look. 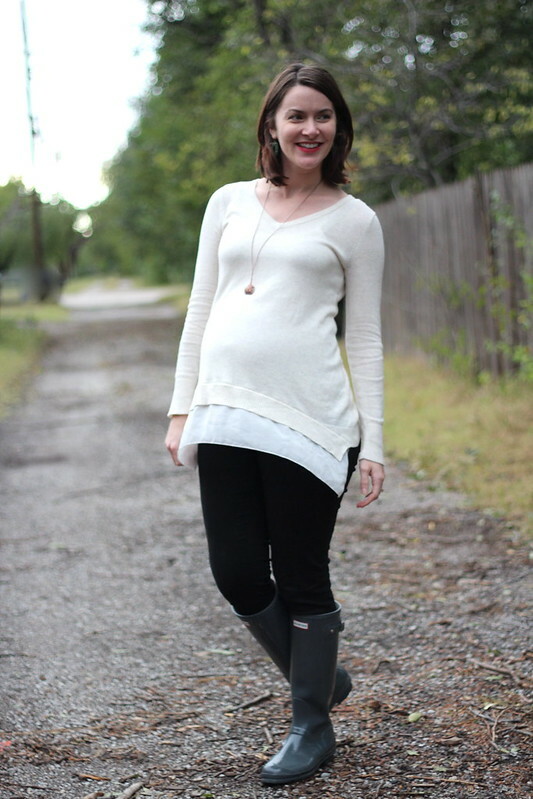 So cozy and perfect for fall! haha, sometimes I think it is surprising that I don't weigh more given how much I talk about food and how much I love it all. (except fruit, but that's a different story) also, can I have your sweater when I'm done? It look sooo comfy!! You are so funny! I wish I had an excuse for my love of donuts... You are looking amazing! Now I want donuts! Yum! Your bump is really showing now. Yay! That outfit looks so great on you-- and the boots are the perfect addition! And yes, the donuts....I have been eating quite a few lately myself too! ;-) SO dang good. Who cares about the 40 lbs, you look freaking fantastic! 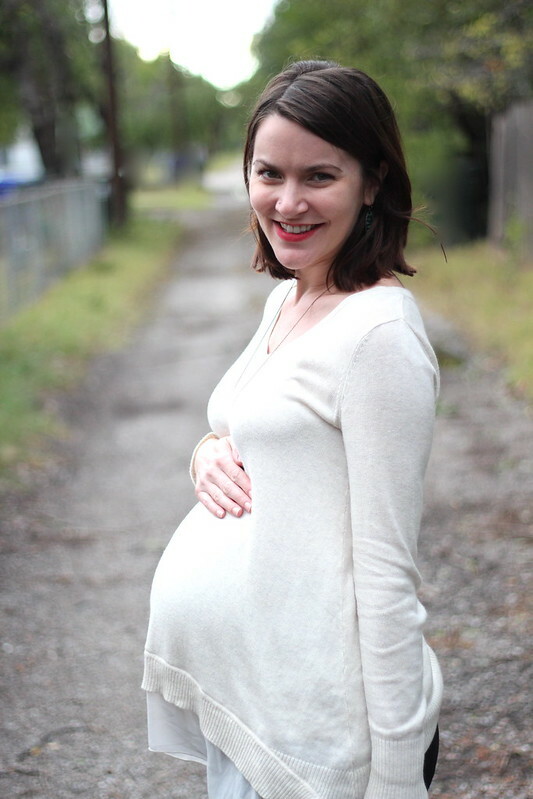 You're seriously rocking maternity style (and this outfit would be super cute for a non pregnant gal too). That sweater looks like it's the ultimate in comfort. I love how you kept everything simple but ties in the green earrings to your green boots. I'm so glad I can finally wear sweaters... They're going to be the lifesaver of the rest of my pregnancy so I don't have to buy any more clothes. Donuts are my weakness in life, and I've never even been pregnant! And yes for cold weather-I'm all about it this year, loving the fall and winter clothes. that donut didn't by chance come from Hurt's did it? You look great!! Love the layered look you've got going on with that sweater! I'm only about 3 weeks ahead of you...I'll be at 37 weeks tomorrow. Eek! For me right now my weakness is candy corn. I love that stuff, but it's gotten bad...like I've gone through 2 bigger bags of it in a week and a half! :) Hope you're feel great still! I absolutely love your sweater! I bet you could wear it as a tunic once you have your baby boy. I have yet to experience much cold weather but I'm excited to style them once we move in a little more than a week!